Hey, guys! I know you all had a fantastic weekend for sure! Lately, I have been traveling a lot to explore California since my husband has to stay on East Coast. Sadly, the weather has been changing extremely crazily from warm to cold rainy days. Last week, I travelled to San Diego and saw my bestie Elyse (Faith in Style) again. I never thought that I would such find an awesome travel buddy! Luckily, we accomplished a lot of fun stuff together. I hope I can see her again in March or April. I also decided that to travel with other blogger babies to Phoenix soon. I will tell you more as soon we confirm our trip. Anyway, I had a blast with Lulu's clothing line and thought that it would be cool to create matching BFF outfits. Thanks to Lulus for sponsoring these matching sweaters that we decided to get in different colors. 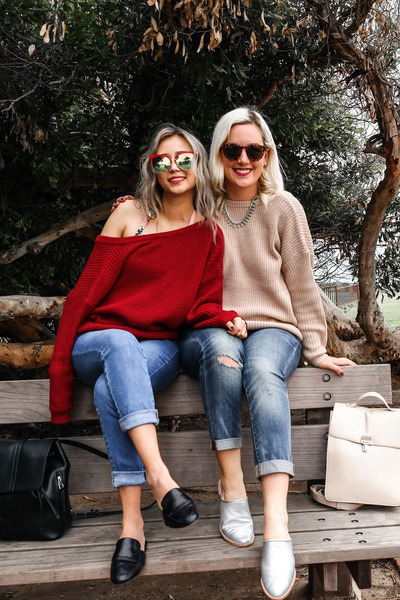 Since they are quite cozy, we thought that we can assemble casual outfits by wearing denim jeans, slip shoes and backpacks in case you are a travel girls like us. Let me know in the comments, where did you travel with your BFFs this year?